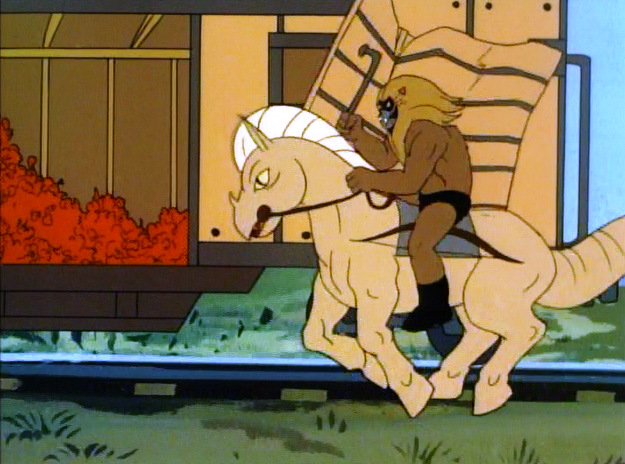 In “Harvest of Doom,” Thundarr, Ookla, and Ariel encounter a train carrying crates filled with “the death flower,” a plant that can overcome the human will and transform people into willing slaves. The death flower cargo is being shipped by the lizard people, Carocs, to an evil wizard hoping to use the powerful plants against a village of innocent humans. 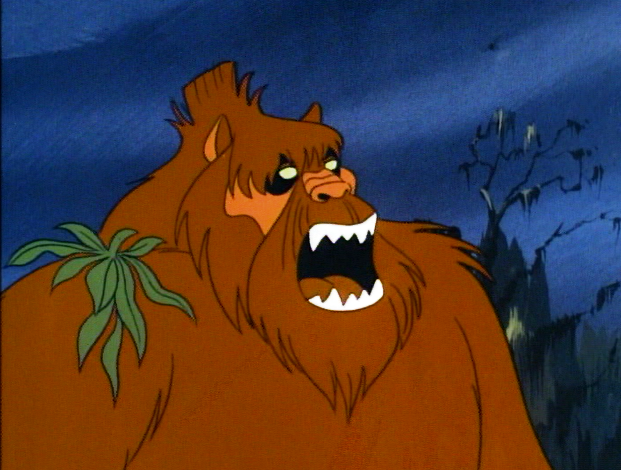 Ookla is affected by the death flower, leaving Ariel and Thundarr to try to free him with the help of a “swamp urchin” and her friend, a beast that resembles the legendary Sasquatch but lives in the waters of the bog. 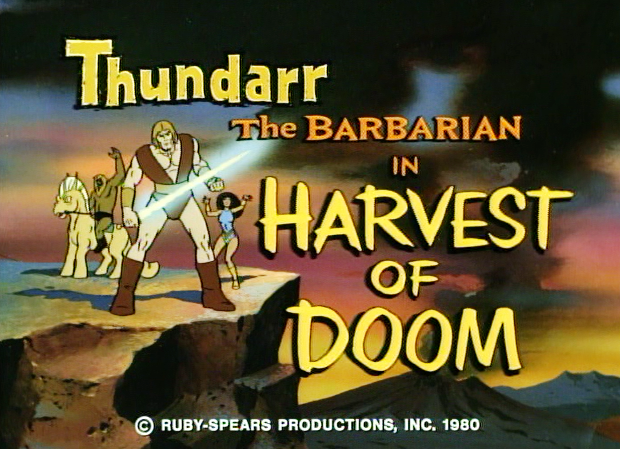 Thundarr the Barbarian (1980 – 1982) is a Saturday morning TV series that doesn’t often trade in half-measures, or temper the storytelling to preserve the sensibilities of its audience, and that’s a good thing, at least on (adult) retrospect. Here, Thundarr and Ariel encounter the aforementioned “swamp urchin” -- a pre-adolescent girl, basically -- and the episode doesn’t sentimentalize her to any significant degree. She is not found a healthy home with adopted parents, nor reunited with her original biological family. She survives to live another day, and that’s about the best that can happen for her in this post-apocalyptic realm. Many other shows would take pains to suggest that she is okay, and taken care of, but not Thundarr. Similarly, the Carocs waste no time in ordering Ariel and Thundarr killed. They are dumped in a pit, and left to die. There’s no talking their way out of a grim fate. Even the climax, which finds Thundarr setting fire to sprawling fields of the death flowers, is final, punchy, and uncompromising. A deadly threat to humankind is extinguished without a second thought. The message from all of this is that-- in this future universe -- the denizens (and even the good guys…) play for keeps. Last week, I wrote a bit about my favorite image in the premiere story: Medieval-styled knights jumping from a 20th century military helicopter to attack Thundarr and his friends. Here, the combination of pre-apocalyptic tech and post-apocalyptic life finds the Caroc -- the green crocodile people -- manning an ancient locomotive. 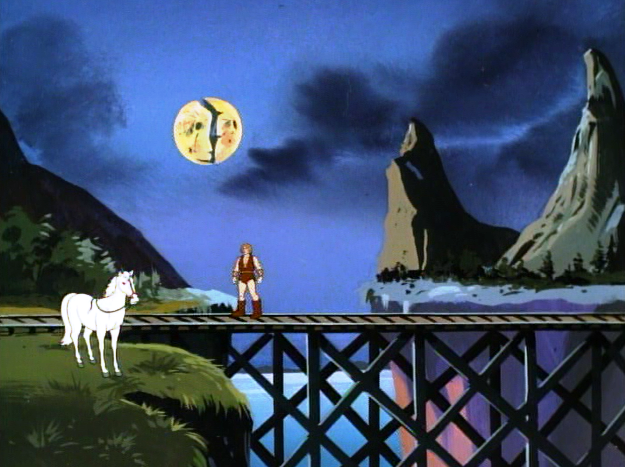 Another resonant image in “Harvest of Doom” depicts Thundarr and his white steed near a railroad bridge, with the shattered split-moon in the night sky. Again, this sort of fantastic image -- which conjures the past and the future -- captures perfectly the imaginative nature of the series. 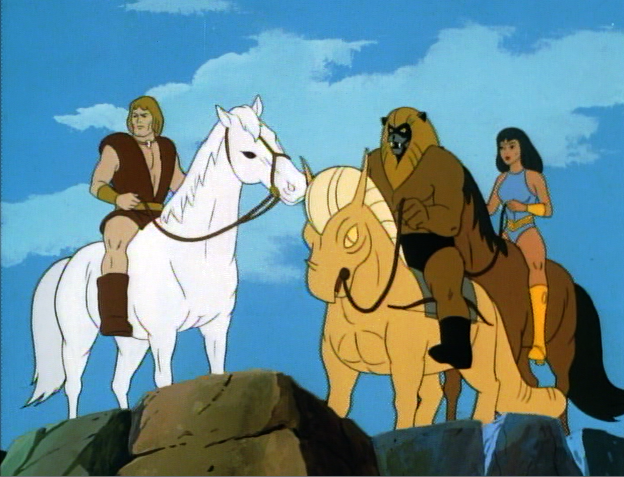 Watching Thundarr The Barbarian as an adult today, it’s kind of fun, as well, to wonder where the characters are, in terms of geography. In last week’s installment, they visited Manhat/Manhattan. In “Harvest of Doom,” Thundarr and his friends explore a Golden Pyramid that looks native to South America…perhaps Peru. I suppose a Thundarr super-fan might be able to chart the barbarian’s path in the series, from one ruined vista to another, from one land to another. If there’s any sort of typical or predictable Saturday morning “sermonizing” in this episode of Thundarr, it is handled with relative restraint. The sasquatch creature -- ugly and frightening -– turns out to be a gentle friend, thus reminding kids not to judge a book by its cover, I suppose. John fun review of this episode. I always enjoyed that Thundarr gave us a tour of the Earth and was not just in the same location through the run of the series. If only Ark II had the budget to do this! I wonder if the producers of The Time Machine(2002) were fans of Thundarr because they used the split-moon too. Love your review. 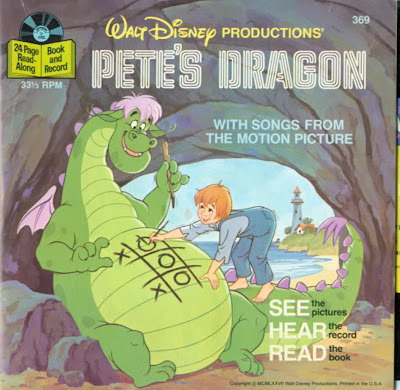 This was one of my favorite shows in the 80s as Saturday Morning Cartoons were dying. I wish you would have posted the cartoon along with the review so I could watch and read at the same time.